Modulate™ Fabric Displays are an innovative fusion of two original concepts recognised for their success in the retail and exhibition industry - Formulate Fabric and Magnetically Linking Display Stands. Modulate™ consists of tubular aluminium frames with powerful built-in magnets which enable you to connect multiple displays linked together to create exciting, reconfigurable, modular fabric exhibition stands. Each frame is covered with a printed tension fabric graphic which effortlessly slides over the frame to create a seamless fabric display with edge to edge marketing. The Modulate™ Display Stands range includes 11 aluminium tubular frames that are covered with double-sided stretch fabric graphics. These 11 frames can be used by themselves or combined to create hundreds of possible stand configurations! 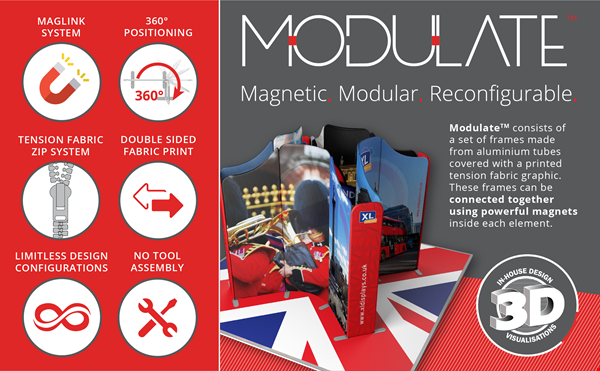 Modulate™ is a new innovative magnetic fabric display stand range that offers flexibility and scalability. Modulate™ Displays are lightweight tube structures that simply push-fit together and effortlessly connect using the integral 360° MagLink™ technology. You can create multiple configurations in almost any shape and size using Modulate™. Modulate™ Fabric Display Stands are an innovative fusion of two original concepts recognised for their success in the retail and exhibition industry. Each frame consists of aluminium tubes with built-in powerful magnets which enable you to connect multiple displays together to create modular exhibition stands which are completely reconfigurable. Each frame is covered with a printed, tensioned fabric graphic which effortlessly slides over the frame to create a seamless fabric display with edge to edge marketing. Lightweight and highly portable, each Ultima Modulate™ Display Stand is supplied with a Modulate™ carry bag with dedicated compartments for feet, hardware and graphics. Each fabric display is supplied with its own carry bag. The tool-free assembly enables you to build your TEXstyle fabric display stand in just minutes. It requires a simple push-fit motion and each tube section features a colour co-ordinated numbering system which saves even more time. Each display panel is supplied with a pair of steel stabilising feet which are attached with a simple twist and lock motion. 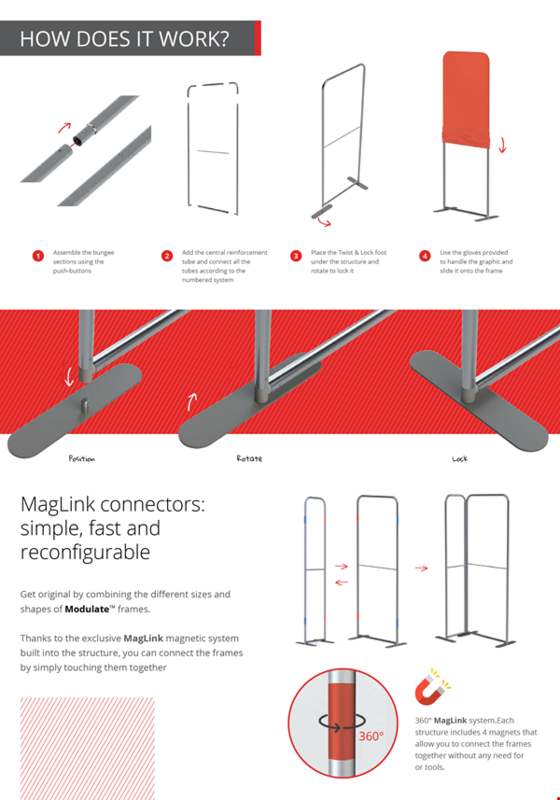 Thanks to an exclusive MagLink™ system which is built into each tube structure, you can connect the frames just by touching them together. The powerful integral 360° magnets hold the structure together firmly and allow you to position the frames at any angle, giving you complete flexibility over the layout of your exhibition stand. The Modulate™ Fabric Exhibition Stand range includes a range of different shapes and sizes and is available in two heights: 2000mm and 2400mm for those events where extra height and visibility is required. Each fabric display is digitally printed in-house using a dye-sublimation printing process. This two-phase printing technique uses extreme heat and pressure to bond the ink directly into the weave of the fabric. This produces artwork which is permanent and vibrant with exceptional print detail and can be machine washed to maintain a like new feel. Modulate™ Tension Fabric Displays are suitable for a wide range of applications, including in exhibition venues, retail outlets, at trade shows, in shell schemes, shopping centres and even in an office environment as a simple office partition for meeting areas. For more information on the Modulate™ Display Stands range, contact us or call us on 01733 511030.